The ambitious Masdar City will rely entirely on solar energy and other renewable energy sources, with a sustainable, zero-carbon, zero-waste ecology. The city is being constructed 17 kilometers south-east of the city of Abu Dhabi. The Swiss Village will be a distinct neighborhood within Masdar City, which will integrate and serve as the home of Swiss companies with expertise in clean technology. To procedurally create 3D models and master plan reports for the corresponding 210,000m2 of build area, ETH Zurich's Chair for Information Architecture is using CityEngine. The master plan for the whole city (6km2) was created by Foster+Partners, combining traditional Arabic city building principles, combined with current and future technologies. The Swiss Village will be located between the Institute of Science and Technology and the central administration building in the heart of Masdar, and will offer a balanced mix of uses with offices, research labs and light manufacturing facilities, restaurants and shops. 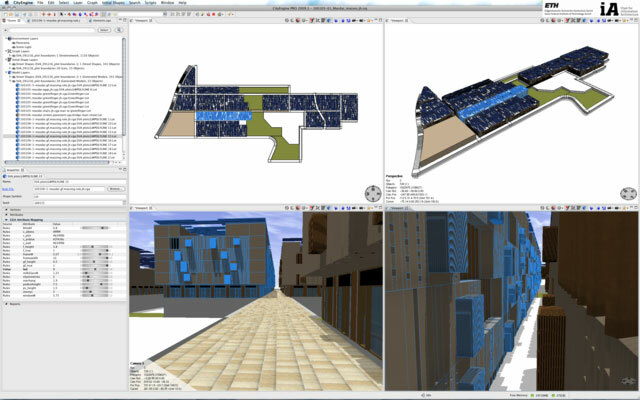 Once the main volumetric language was found, the design was encoded as CGA Shape rules inside CityEngine and the buildings were automatically generated. The rule-based top-down modeling of CityEngine inherently maintains a consecutive order in the levels of detail of the created building shapes. To statistically evaluate the quality of the designs, rule-based reports have been generated using CGA Shape e.g., the impact of changes in the mass model parameters to the gross floor area has been measured and the parametric mass model has been optimized to fit the targeted needs. Further, the basic facade patterns have been encoded as rules and offline renderings have been created in Vue from e-on® Software. "Through the procedural approach we were able to control the overall cubic appearance of the buildings independently of the artistic structural details which cites the beauty of traditional Abu Dhabi architecture" says Dipl. Ing. Jan Halatsch, research scientist. "At all times, we were able to use CityEngine's reporting tool to keep the control over all main design aspects and plan the next design iterations based on the statistical output that the CityEngine generated for us." 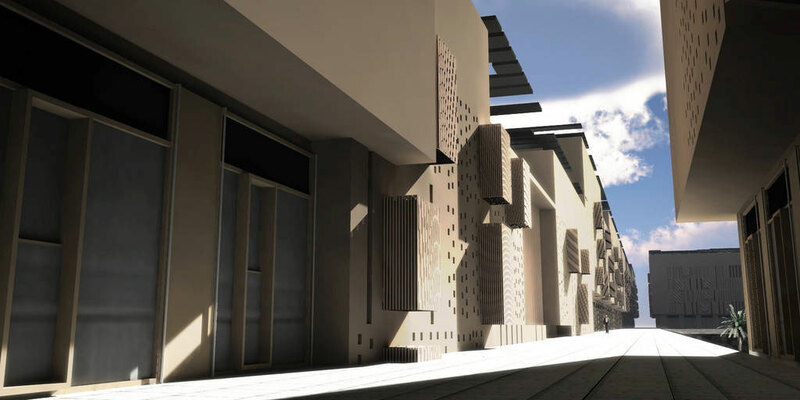 No carbon dioxide, no cars, no waste products: Masdar (Arabic for "source") is the ambitious project of the Abu Dhabi Future Energy Company and has been designed from scratch by Foster+Partners as an ecological city that is only dependent on renewable energy. Of this, 80% is solar energy and the rest is gained from wind energy installations and the conversion of waste materials. An ultramodern infrastructure and building technology will lower energy and water requirements by around 70%. In terms of transport, the urban area of Masdar is accessed using electric vehicles and is linked to the public transport network by a light railway. The aim of Masdar is to prove that a high standard of living is also possible with clean energy and, in addition, to turn Abu Dhabi into an example for maximizing renewable energy.